Education is a major factor in our endeavor to deliver quality emergency medical care to Belize. 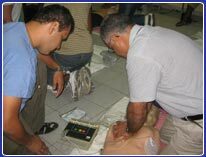 Training began in 1996 to increase the skills and availability of Medics countrywide. Over two hundred persons have been trained. Our most recent accomplishment is becoming an International Training Organization for the American Heart Association.